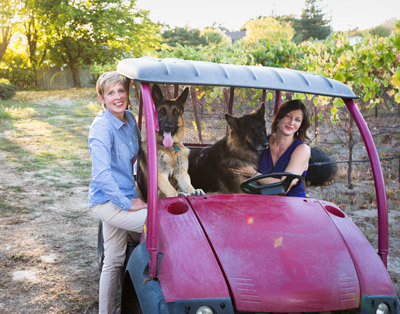 Sadie's Vineyard is named for the family's first German Shepherd, who lived her life blissfully on this 5 acre parcel in beautiful Sebastopol Hills, along the chilly Bodega Highway corridor. Shepherd #2, Kodiak, is now in charge of gopher monitoring. As a sweet reward, he gently snags a single ripe grape with his teeth every now and then. The site is comprised of classic Goldridge soil and is planted to Pommard and Dijon 115. At an elevation of 234 feet, it has the perfect balance of sun and fog to produce spectacular Pinot noir grapes. The 2014 vintage is the first wine from Sadie's Vineyard to be bottled as a single-vineyard designate, and we are pretty excited about the results!